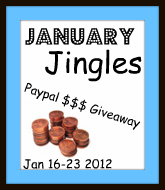 Welcome to the January Jingles Paypal $100 Giveaway hosted by The Knit Wit by Shair and Multi-Testing Mommy. After the holidays, couldn’t we all use a bit of extra money?! I know we certainly could. Enter to win $100 USD and discover some new blogs at the same time! Thank you so much for participating in this event and for posting as well!